A perfect Yellow Cake with Double Fudge Frosting. This is what “from scratch” baking looks like!! When it comes to cake, what’s your favorite flavor? 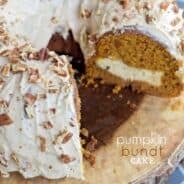 Since I started this blog, I’ve been working on creating ‘from scratch‘ recipes for cakes and cupcakes. I certainly am not against using a mix, however, once you bake a cake from scratch you’ll have a hard time going back. 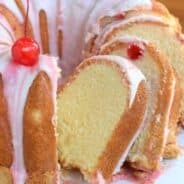 I’ve already got a delicious white cake and chocolate cake recipe. But the yellow cake has been a struggle. I don’t want something dry and crumbly. But I don’t want it overly moist it can’t hold up to a good thick pile of frosting. You soak them in water, ring em out, and wrap them around your cake pan. They keep your cake level when it rises. I know some people use towels for this, but with my luck those towels would fall off and start a fire, haha! 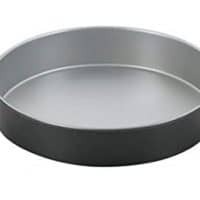 Now that you have your pans prepared (2 9-inch round cake pans), start on the cake batter. Beat butter for two minutes, add sugar and vanilla extract. You’ll also add eggs, beating well after each addition. Combine the flours, baking powder, and salt in a small bowl. Add to the batter, alternating with the milk. Beat for about 3 minutes. Pour cake batter into greased and floured cake pans. Bake and cool completely before frosting. Add milk chocolate morsels and butter to a small microwave safe bowl. Microwave for 30 seconds, mix and continue heating in 30 second increments until smooth. In a large mixing bowl, combine sour cream, cocoa powder, salt and melted chocolate. Add powdered sugar and milk, beat for 3-5 minutes until fluffy. Speaking of frosting, I love the stuff. I like it even more than the cake. While some people scrape off excess frosting from their cake or cupcakes, I’m that person that is snagging your excess. There is no such thing as too much frosting. I also have a secret confession. I love the fudge frosting in a can. Dip pretzels and apples in it? Yes please. I love how it “hardens” on a cake. Today’s double fudge frosting tastes just how you would imagine a homemade copycat version of canned frosting would taste, without any artificial color or flavor! Does that make sense? It’s rich and fudgy. 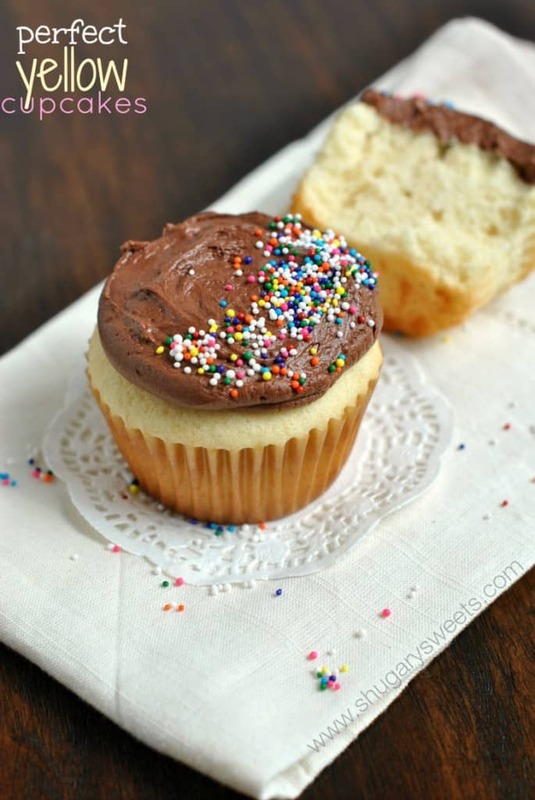 If you prefer a lighter fluffy buttercream…check out this chocolate buttercream frosting. To assemble the cake, place one layer of cake on a cake plate. Spread a big dollop of frosting on top, then add second layer of cake. Using an offset spatula, spread the remaining frosting on sides and top. Add sprinkles if desired! To make a crumb coating with the frosting, spread a very thin layer of frosting over the cake. Refrigerate for 10 minutes. Add final layer of frosting and enjoy. This is helpful if you find that the frosting is not spreading well and bringing crumbs into the chocolate. I usually skip the crumb coating because I’m lazy, haha! I know what your next question will be too. Of course you can! I recipe tested these, and they turned out beautiful. Mind you, I made 4 batches of yellow cake to get this recipe perfect. So go enjoy a cake or cupcakes today!! Each batch of yellow cake makes 24 beautiful cupcakes. You decide if your dessert is going to be CAKE….or CUPCAKES. 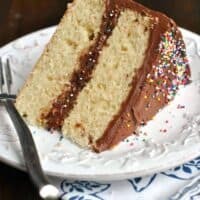 From scratch, yellow birthday cake recipe with fudge frosting! For the Cake, beat butter for 2 minutes. Add sugar and vanilla, continue beating with electric mixer. Add eggs and extra egg yolk, beating well after each addition. Combine the flours, baking powder and salt in a small bowl. Add to mixing bowl, alternating with the whole milk. Beat 3 minutes after all is added. Pour cake batter into two greased and floured 9inch cake pans. Bake in a 375 degree oven for 25-30 minutes. Remove and cool completely. For the frosting, add milk chocolate morsels and butter into a small microwave safe bowl. Microwave for 30 seconds, mix and continue heating in 30 second increments (mine took one minutes, 30 seconds to melt completely). In a large mixing bowl, combine sour cream, dark cocoa powder, salt and melted chocolate mixture. Add powdered sugar and milk, beat for 3-5 minutes until well blended and fluffy. To assemble cake, lay one layer of cake on a cake platter. Spread frosting over the top. Add second layer of cake. Spread frosting over sides and top of cake. Add sprinkles for decoration. ENJOY. To make cupcakes, line a cupcake tin with paper liners. 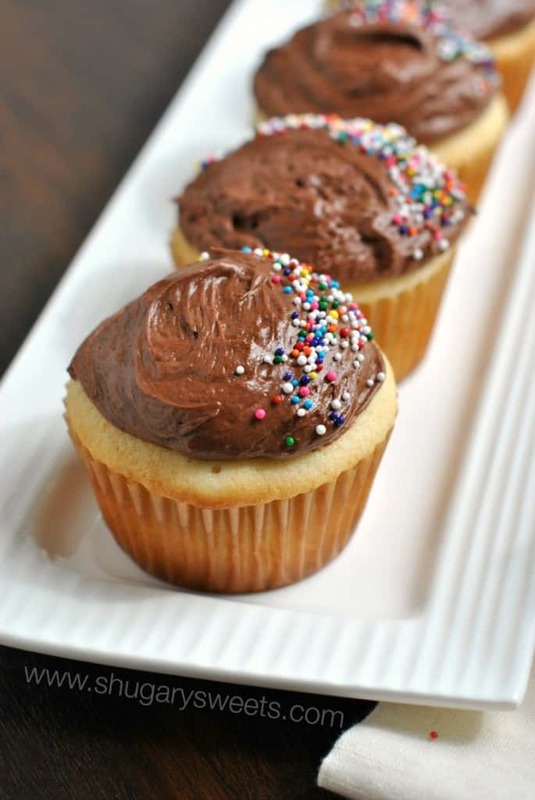 Scoop batter into cupcakes until 2/3 full (makes 24 cupcakes). Bake for about 15-17 minutes. Cool before frosting. Thanks Averie. The yellow cake was a bit harder…too many or too few eggs can ruin it! Thanks for pinning! 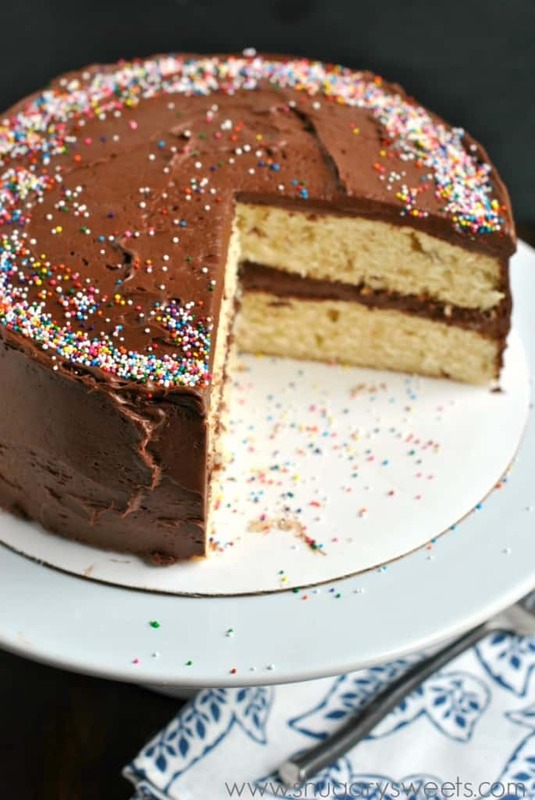 Everyone loves a yellow cake with chocolate frosting, right?? I have yet to add a “from scratch” cake to my repertoire but it’s definitely something every baker should have. Yours looks fantastic! Love how this can be cake and cupcakes! Yellow cake is absolutely my favorite. This is so pretty Aimee! Thanks for pinning Renee! I was having the same issues in making this. The combo of all purpose and cake flour gives it a nice crumb. The two eggs plus an extra yolk helps too!! ENJOY. I’m always looking for a good yellow cake recipe, so this one is joining the repertoire! By the way, I learned in a frosting class (I took one, yep) that if you add a little corn syrup to the frosting, it will make it harden like the stuff in the can. Because I agree. I love it when it gets more solid! What a gorgeous looking cake!! I must be the odd person out (don’t answer that…I know what you are thinking) because I have done the scratch cakes…and I actually prefer the box mixes over them every.single.time. Not that mine are dry or anything, I just like the box mix texture more! Call me crazy…but give me the preservatives 🙂 LOL! Now homemade frosting trumps canned every time…although I do love the canned stuff too! Chocolate frosting and animal crackers for the win! Animal crackers in frosting!?! Yummy!!! This looks so good Aimee! A true classic! I love homemade cakes but have yet to find a yellow cake that I like. Can’t wait to try yours! Oh…I can’t resist a homemade yellow cake!! And that frosting made with milk chips…YES! Sour cream chocolate frosting is the BEST! Love this cake! I agree – once you make it, it’s hard to go back! Pinning this beauty! Haha!!! 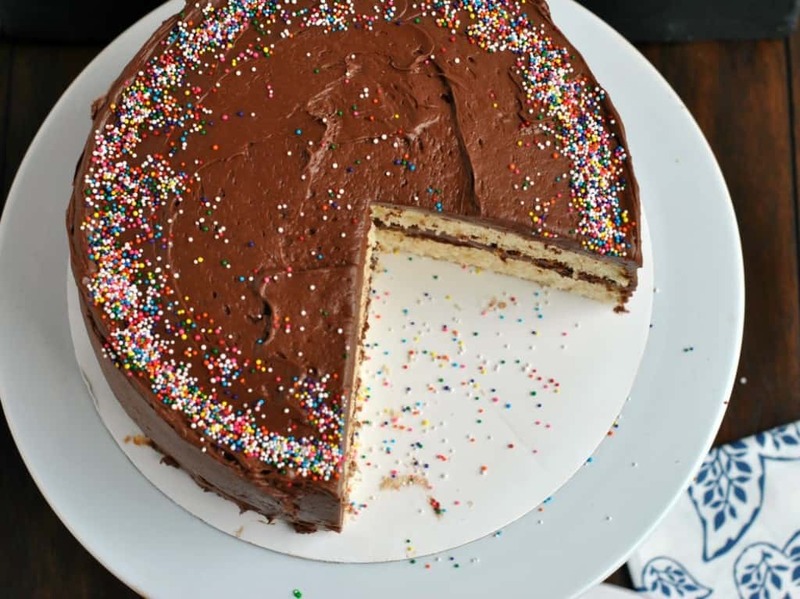 It’s exciting to stare at cake and drool, and those sprinkles can be mesmerizing! What an absolutely gorgeous cake! I need a slice pronto! The cake is like a spoon for frosting…. Delicious! How soft and fluffy does this cake look? Love the height too. Perfect birthday cake! This cake is beautiful! The chocolate frosting is making my mouth water just looking at it! Yum! I like my cake with lots of frosting too! 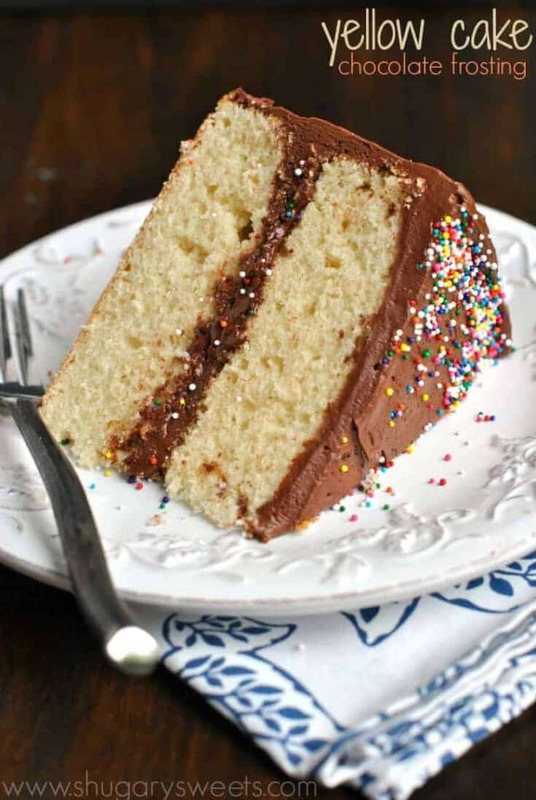 Yellow cake with chocolate frosting is my husband’s FAVORITE cake…and his birthday just happens to be next week. I’ll be trying this for his birthday! And suddenly I NEED a giant slice of yellow cake with fudge frosting!! This looks amazing!! This cake is gorgeous Aimee! I love yellow cake too and finding a good scratch recipe is so hard. I can’t wait to try this especially with that glorious frosting – totally my favorite part too! Pinned! from scratch is pretty much always best! and this cake def. delivers-it’s gorgeous and simply classic and PERFECT! looove that frosting! Ahh this frosting! I have always preferred fudgy over fluffy. I am excited to try this recipe. 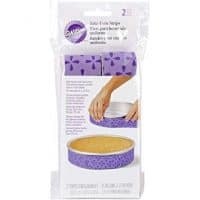 I love the flavor of boxed yellow cake but have always found it a little dry. Pinned!! Chocolate fudge frosting is my favorite thing to eat! I always take the excess from other people’s plates and honestly, I leave the cake parts over and just eat spoonfuls of the frosting! nothing better than a classic cake! Oooh i made something very similar a few months ago, and it was delicious! Loved seeing how you had a different take on it. Looks like a great dinner to me, enjoy. My daughter’s favorite type of cake. ???? I made this for my daughters birthday and she absolutely loved it! Thanks for the fabulous recipe! This is my husband’s favorite birthday cake!! GREAT recipe! 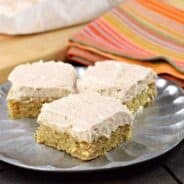 This is one of those recipes I just keep coming back too, so classic and delicious! This is my kids’ favorite classic cake combo. Love this frosting! Best dessert! Yellow cake and fudge frosting are made for each other! My favorite cake ever. Just yum!